The contents of the mailer include two personal and visually powerful letters. 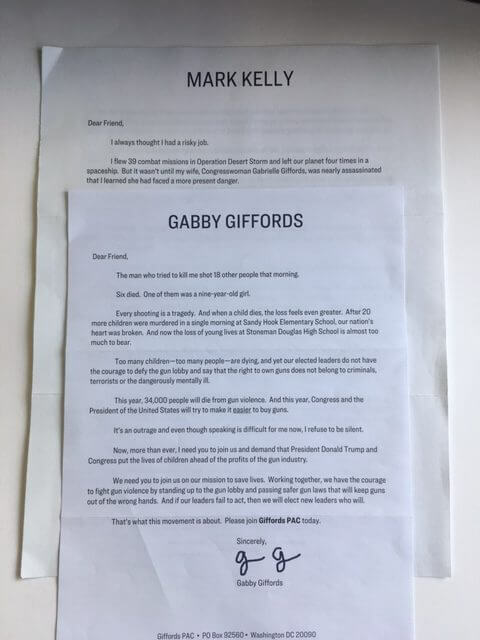 The first is from Gabby Giffords herself, and the second is from her husband, Mark Kelly. “The man who tried to kill me shot 18 other people that morning. There is no build up to this, no context, which makes it more powerful. The true story on its own is enough to catch and hold our attention, as well as bringing us right into the issue central to Giffords PAC. Kelly begins his letter with his own visually compelling and personal story. “I always thought I had a risky job” he states, going on to tell us of his 39 Desert Storm combat missions and four trips into space. To the average person, that’s risky stuff, and it helps to pique our interest in Kelly. But he continues on to root risk in the everyday world. Most of us will never travel to space. But the “more present danger” that Giffords faced, that of being shot, is, unfortunately, very real. The openers are different for both letters, but they work to convey the same message in a compelling, personal way – gun violence is real, mass shootings are happening, and we are all at risk. Both letters also make powerful and effective use of data to send their message. In Kelly’s letter he states that “every year, 34,000 people are killed with guns” which is a horrifying statistic. Giffords cites the same statistic, but she says, “this year, 34,000 people will die from gun violence.” It’s a powerful statistic for both letters, but the language Giffords uses makes it feel more urgent—these people “will die” due to the current state of gun control, which I feel is a powerful motivator to support the call to action later in the letter. Throughout the rest of Kelly’s letter, he incorporates statistics in a way that helps to build the story. It’s easy to get bogged down with numbers. And, it’s also easy to fall into an overly emotional tone without evidence to back you up. Kelly is effective at using data to strengthen his story and make a compelling case. His story is better because of the data, and the data is more compelling because of his story. Kelly and Giffords invoke the 3 C’s of Marketing in each of their letters: Context, Community, and Clarity. Their lead-ins set the context of the mailer and the mission of the organization. They build the body of the letter by developing a community-centric tone. Kelly writes that “right here in our country,” “simple every day events” make us question the safety of our homes, schools, and communities. Gun violence is a national issue, but it impacts Americans on a local scale, shattering communities. Kelly successfully creates the sense that GIffords PAC is a community of concerned Americans that aren’t just looking for financial support. They truly want the donor, as an individual, to become a part of their community. “Gabby and I are counting on you,” Kelly says at the end of his letter. As for the last C, Clarity, it’s clear what Giffords PAC is counting on the donor to do. The issue and the facts are clearly stated, as are the successes they’ve achieved, their long-term goals, and what you as the donor can do and stand for. While both letters talk about gun control and Giffords PAC, they are centered on the donor. The letters make liberal use of the words “we,” “our,” and “you,” the last of which is a critical piece. Using “you” helps the letters speak directly to the recipients. 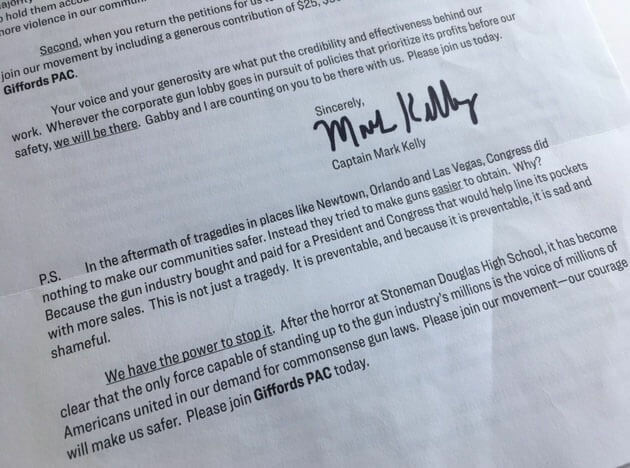 In Giffords’ letter she writes, “now more than ever, I need you.” And Kelly tells us “our voice will be so much stronger if you’ll be there beside us.” Both poise the donor as pivotal to the solution. Did you know that the P.S. is the second most read part of a letter after theopening sentence? Kelly includes a P.S. at the end of his letter that succinctly summarizes his main ideas, and emphasizes that we, as Americans, are the only ones who can enact change by demanding better gun control laws from our elected leaders. Even if a reader skipped over the body of the letter, this P.S. clearly states the issue at hand with a call to action that makes the reader a pivotal piece of the solution. In addition to the letters, this mailing included two pieces tied to direct action. The letters make the case for Giffords PAC and are followed up with action-oriented content. The first is a yellow slip with a bold headline: Washington Must Find the Courage to Take Action! It echoes the tone of the letters—we will not stand by while gun violence happens, and we demand that leaders act. Then follows a list of clear steps that elected leaders can follow that Giffords PAC believes would achieve greater gun safety. Part of what makes this piece of the mailing strong are the details. This slip cites specific actions for leaders to take and specific legislation that should and should not be a part of solving the crisis of gun violence. It gives the impression that this organization is clear in its goals, understands the situation, and has identified clear solutions. There is no passive language here. Action-oriented words are key to making this slip work. The second action piece in this mailing is the donation slip. Again, the purpose here is clearly stated to help reiterate what your contribution will do. The recipient’s name and address are printed on the slip as well. All a donor has to do is check the box indicating the amount of the gift. Another effective and personal touch is the photo of Giffords and Kelly that appears in the upper right corner. It is always helpful to put a face to a name and better know who you are supporting and working with. This slip offers multiple ways to give, too. 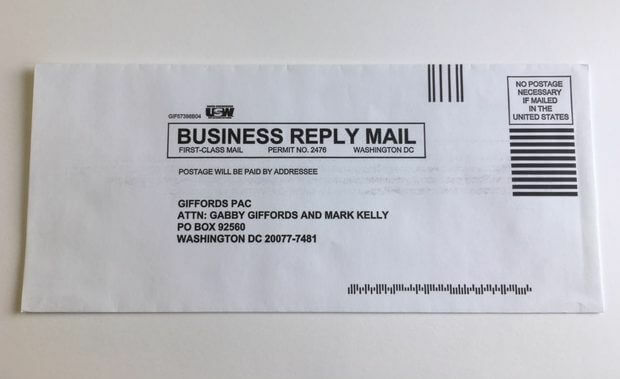 You can mail this slip back to Giffords PAC or “put your money to work right away” at the web link printed on the bottom. 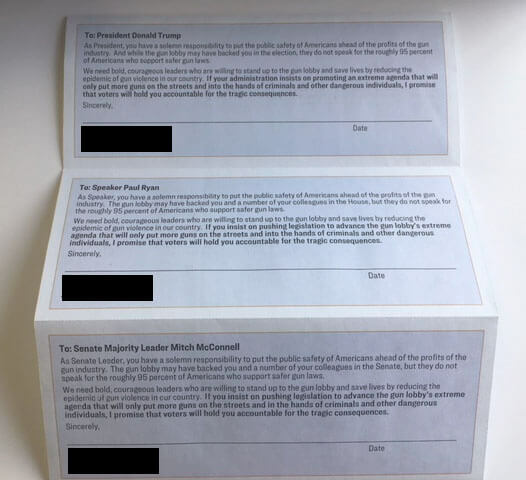 Beneath the donation slip itself are three letters to the President, Speaker of the House, and the Senate Leader for donors to sign. Giffords PAC takes on the work of ensuring these reach these government leaders. It’s an easy way to start making donors feel involved in the cause. Including a remittance envelope in the mailing makes the process one step easier for recipients. The envelope requires no additional postage to be mailed. Many donors today choose to give online. However, including a remittance envelope is a nice courtesy that makes it convenient for recipients to take action. Need help with your direct mail or fundraising campaign? At Paw Print, we specialize in direct mail appeal production. Contact us to start reaching more donors today.